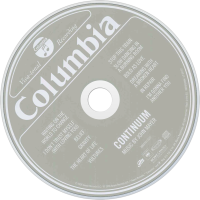 Continuum is the third studio album by American musician John Mayer, released September 9, 2006 on Columbia Records. Recording sessions for the album took place during November 2005 to September 2006 at The Village Recorder in Los Angeles, California, Avatar Studios and Right Track/Sound on Sound in New York City, and Royal Studios in Memphis, Tennessee. Production was handled primarily by Mayer and Steve Jordan. It marked a change in Mayer's musical style, and incorporated musical elements of blues and soul more heavily than in his previous work with pop-rock. The album debuted at number 2 on the U.S. Billboard 200 chart, selling 300,186 copies in its first week. It also reached the top-ten in several other countries and sold over 3 million copies worldwide. Upon its release, Continuum received generally positive reviews from most music critics and earned Mayer several accolades, including a Grammy Award for Best Pop Vocal Album at the 49th Grammy Awards. Rolling Stone magazine named it the eleventh best album of 2006.